Online Medical General Chemistry II is equivalent to a one semester course designed for individuals who need second semester general chemistry as a prerequisite to apply for admission to health professions programs. The overall goal of this online chemistry class is to give the student interested in the health professions an introduction to general chemistry emphasizing the concepts that will be important for, and provide the basis for, the subjects the student will encounter in their future studies. These subjects covered in this course include mixtures, trends in the periodic table, organic chemistry, kinetics, chemical equilibrium, acid-base equilibria, thermodynamics, electrochemistry, elements in nature, chemistry of transition elements and nuclear chemistry, bonding, theories of covalent bonding, shapes of molecules, and intermolecular forces of liquids and solids. Click here to see the syllabus for General Chemistry II. General Chemistry II is designed for the student to take the lecture (CHEM1011) and lab (CHEM1011L) concurrently in order to earn four credits. For the full four credits, you must register for both CHEM1011 and CHEM1011L. For students who only need a specific portion of General Chemistry II, however, you have the option to take lecture only (CHEM1011 three credits) or lab only (CHEM1011L one credit). 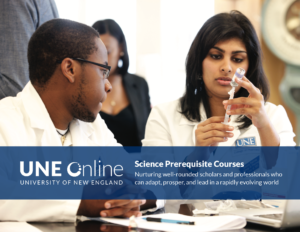 Click here to learn more about the laboratories that accompany Online Medical General Chemistry II. Working at the pace typical for a four semester hour course, the average student will complete the online course in approximately 16 weeks. Many students are nontraditional students who have elected an online course for flexibility. Since the course is self-paced, you may complete the course in less than 16 weeks. CHEM 1010 (General Chemistry Lecture), CHEM 1010L (General Chemistry Lab), and college level algebra must be completed before registering for this course. All prerequisite courses must have been completed successfully within the past seven years. The textbook is not part of your registration fee. The textbook and study guide are both available through our bookstore at http://www.newengland.bkstr.com.